Painting is a simple and cost-effective way to change the look of your home’s interior, but at a certain point many of us grow tired of neutral colors and solid painted walls. If you’re looking for something different to spice up the look of your home, gather inspiration from this list of 6 creative painting ideas. Color blocking is a trend in fashion, but you can bring this exciting look to your walls as well. The process involves creating large blocks of vibrant colors to bring your walls to life – bright colors, contrasting colors, and colors that normally wouldn’t be paired together. 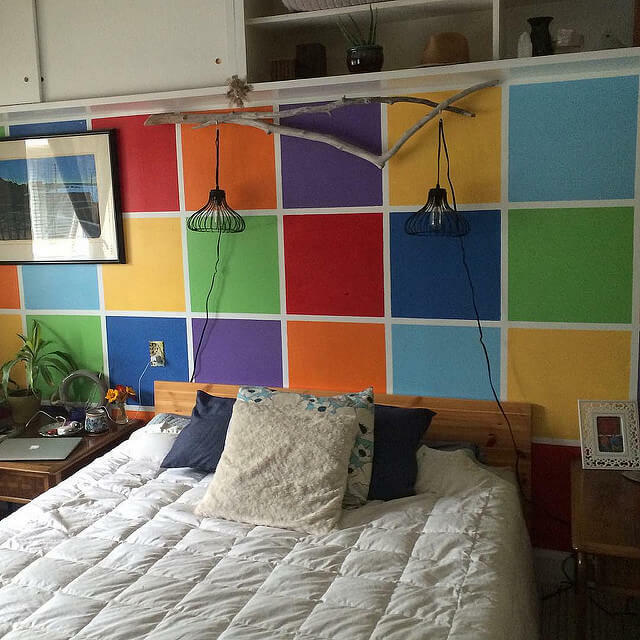 On the most basic level, this can be accomplished by painting each square of the room a different color. You can also create blocks within the same wall (for example, a dominant color block on the bottom of the wall then white or neutral paint leading up to the ceiling). Some people also experiment with diagonal color blocks or using color blocking on the ceiling. Stencils are an easy way to give your walls a fun pattern instead of the same old monotonous look. The variety of stencils available today is incredible – you can find geometric patterns, florals, letters, boarders, quotes, and a variety of other shapes and pictures. Stencils can add sophistication in your dining room or personality in your kids’ rooms. Keep in mind that stenciling is a very exact process. You’ll need to be careful with painting and also with how you line the patterns up. There are several DIY videos available online, or you can also hire a professional. 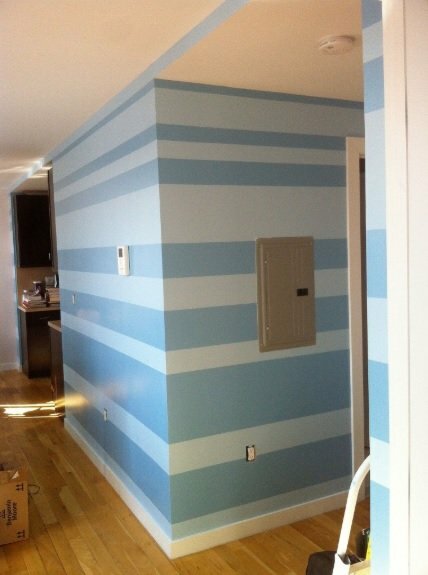 If you’re worried about your ability to work with stencil templates, you can always get creative with the painters tape to create stripes and zigzags on your walls. First plan out the sort of look you are going for. Horizontal or vertical stripes? Will they be uniform or different sizes? How many colors will you be using? Next, mark off the areas with painters tape and paint each stripe with the planned color. After everything is dried, you should be able to remove the tape and see clean lines. Depending on the colors and design you choose, the stripes can create an interesting but professional focal point, or fun and wild display. Some of the ideas on this list are quite bold, including stripes, geometric patterns, and vibrant contrasting colors. For a more subtle and sophisticated look, you may consider antique distressing your walls. In this process you make the walls look older than they are. To create this weathered look you start out with a regular base coat of paint, then (typically with a lighter color of paint) you apply a light coating over the top. The end result will be a faded, distressed look that adds character to your home. Murals are an excellent way to add an artistic focal point to your room – a feature wall that will be the spotlight of your living room or a way to express your personality in your bedroom or children’s rooms. A mural requires careful planning, starting with a scaled down drawing of how the finished mural will look. After the walls are prepared, you must then mark the drawing out and choose the most efficient method of paint application for each part (for example, for some areas you may be able to use a roller but other details will have to be brushed in.) The entire process is time consuming, but done right, completely worth it. Lower your risk by hiring a painter that has experience painting murals and project pictures to demonstrate their past mural work. To round out the list, let’s talk about a simple and fun solution that any homeowner can try – chalkboard paint. This is a special type of paint that creates a chalkboard surface on the wall, allowing you to write, draw and erase the surface. The process is the same as any other paint – just prepare your surface, apply the paint and let dry. Chalkboard paint can be a fun addition to your kitchen, allowing you to make grocery lists or plan out the weekly menu. It is also a perfect addition to any children’s bedroom. As this list proves, there are plenty of ways you can get creative with paint to make focal points, interesting designs and to show off your personality. Explore these and other creative painting ideas to spice up the look of your home.